Summer is winding down and it’s finally time to hit your favorite carnivals and amusement parks for a little last-minute adventure before school starts. Whether you’re a thrill seeker or a laid-back-people-watcher, it’s hard to resist the smell of funnel cakes and corn dogs drifting from the food tents nearby. Are you craving a notorious carnival indulgence, but don’t want to compromise your back to school health and wellness goals? 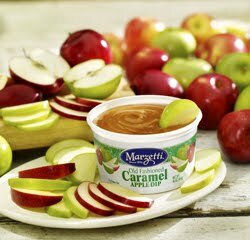 Pack these sweet and sensible treats along with you to satisfy your cravings with healthier options and to save a little money along the way. Make this classic carnival treat both sweet and salty by adding your favorite treats. 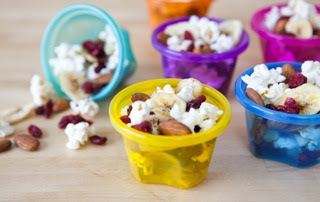 The best part about this snack is that you can make the recipe your own! Combine a healthy serving of fruit with a little sugar and protein to keep you energized all day long. With this classic spin on hot dogs, you can indulge in moderation! 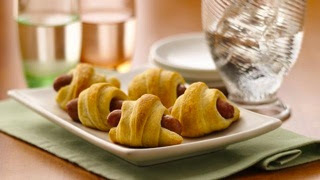 Roll each crescent roll around a hot dog and bake for 12 to 15 minutes or until golden brown at 375°F. These ‘fries in disguise’ may take a little extra effort, but the end result will have your friends begging for the recipe. 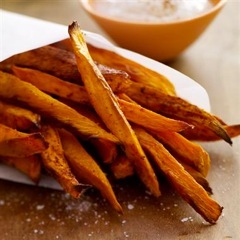 Toss sweet potatoes with oil. Add brown sugar, cinnamon, ginger and salt. Spread on a shallow baking pan and bake for 30 to 35 minutes on until golden at 400°F. For a sweet dip, mix the sour cream, yogurt, honey and cinnamon. Satisfy your sweet tooth with a sensible ice cream treat. Process strawberries in a food processor until smooth. 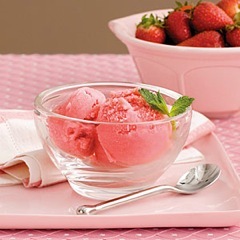 Combine strawberry puree with buttermilk, sugar and vanilla. Cover and chill 1 hour. Pour mixture into an electric ice-cream maker and freeze as directed. Garnish with mint if desired.